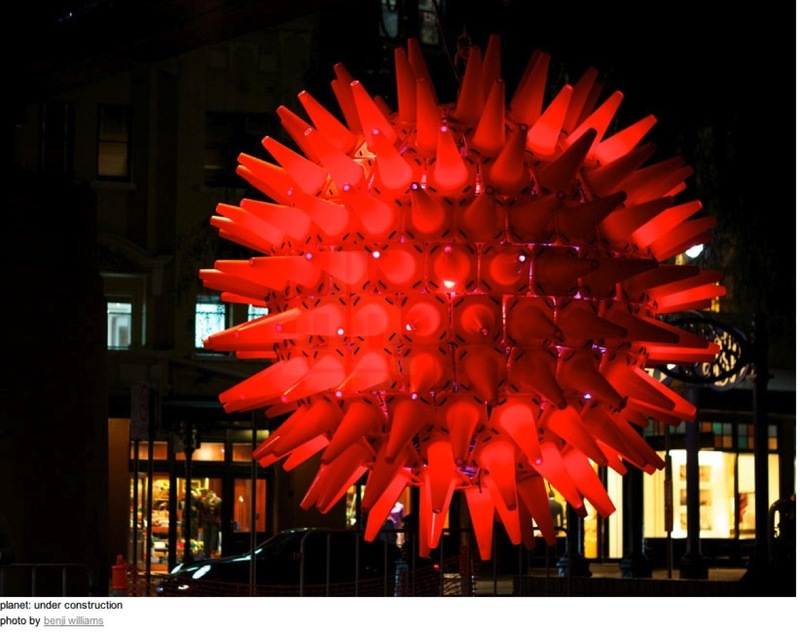 Giant glowing orb made from 200 traffic cones « Adafruit Industries – Makers, hackers, artists, designers and engineers! giant glowing orb made from 200 pylons by woods bagot. ‘planet: under construction’ (PUC) is a giant glowing orb which is composed of a central metal spherical framework in which 200 bright orange traffic cones are strapped by bungee cord, giving the suspended lighting installation its powerful shape. the sydney studio of international architecture firm woods bagot created the massive hanging work, employing the humble pylons to symbolize their practice–the ubiquitous objects are a part of our everyday landscape, signposting alteration, creation and flux in our built environment. ‘PUC’ show as part of vivid sydney (may 24th – june 10th, 2013) – the southern hemisphere’s largest annual festival of light, and can be found near the corner of george and alfred street under the cahill expressway in the circular quay. its position makes it an important marker near the point of entrance to the event, standing as a temporary landmark for visitors coming from the train station and the city.